On this episode of Radio Active, geek fitness gets a gut check, Nuketown delves deep into statistics and I discover a new path to gaming adventure with the Pathfinder RPG alpha. I also try two new online productivity tools and offer my thoughts on how to write a better role-playing game adventure in less time. Starting a Pathfinder PBEM with Daniel Perez of the Gamer Traveler. Just converted my character over from the Dark City campaign; visit Nuketown for a comparison. Heard from Rich at the Cannon Puncture podcast after Radio Active #65, who agreed with me about the geekiness of Baseball, and wondered why I wouldn’t be going to Yankee Stadium in its last year. Which is a good question. 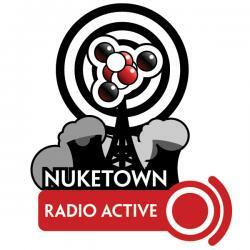 Nuketown gets some upgrades, namely in the form of a new FeedBurner feed for Radio Active. Trying to figure out how many of the 8,500 “mp3 requests” last month were real. Two geeks (Doug from GeekAcres, Zach from Geek Survival Guide) get serious about losing some weight. The podcast and blog chronicles their efforts. A team whiteboarding application, allows people to chat and talk in real time, draw on the canvas, and co-browse web pages. Could be useful for an online game, though minis would be problematic. Sychronizable note-taking system for Mac, Windows and mobile devices. I talk about how to write a better adventure in less time by focusing on the content you need, rather than the fluff you don’t.